As we weave our way through coarse grass and scrub, Joseph, a Samburu Masai sits atop the Toyota Land Cruiser, using his bird’s eye perspective to give Steve, our guide, directions towards the bone-cracking noise coming from somewhere in the thick of the bush. “That noise is made by hyenas finishing off the remnants of a giraffe, which was killed by lions about ten days ago,” Steve tells us, as the bone-crunching clamour continues. How they know these things and how they navigate their way around miles and miles of open plains and dense valleys is a mystery to me. “It’s like getting around anywhere,” says Steve. “Once you are familiar with the landmarks, it’s easy.” I’m not convinced. There are too many thorny acacias and very few cut paths. Statuesque and proud, wrapped in a red kikoy and holding a spear, Joseph surveys the land from on high, while Steve navigates his way through wild vegetation. As their eyes scour the plains, nothing escapes them, from the Goss hawk perched on the end of an acacia branch in the distance to the slow-motion tortoise right in front, who miraculously avoids being trampled upon. I find myself scouting almost in competition, wanting to be the first to spot the rare lion or the rarer leopard. My teenage boys have joined Joseph on the roof, and I can hear the cries of relish as we bump along the rough terrain. There’s nothing more heartening than hearing the pleasure of your children as they discover the world around them, especially as the best life has to offer is usually met with a grunt! I’ve brought my two sons, Joshua (16) and Louis (14), to Kenya on safari. It’s not our first, but it is our first properly adventurous one. 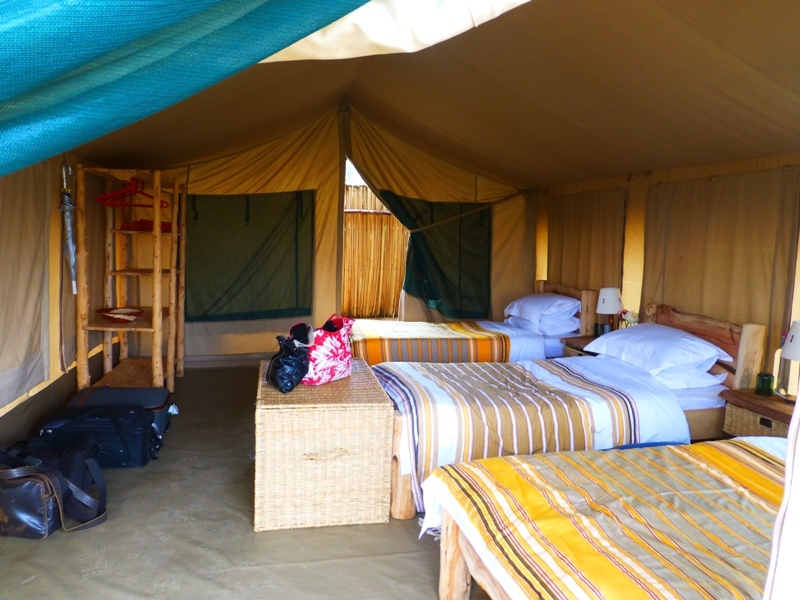 We’ve come to Laikipia Wilderness, a safari camp opened by Steve and Annabelle Carey just a few months ago, in the Laikipia area, which is on the Equator in the Rift Valley Province. It covers almost two million acres and runs from Mount Kenya in the east to the Rift Valley in the west. It is wild and sparsely populated, with large areas covered by privately owned ranches. These cattle ranches share the land with the wildlife, and the business and community-led conservation activity, which has increased with the realisation that tourism plays a vital role in the local economy, has resulted in protected game roaming freely and safely and the conservation of traditional tribal life. The area is not as rife with the big five as the Masai Mara, but it offers a wilder, more intimate experience. Steve is passionate about wildlife and the idea behind Laikipia Wilderness is to be as spontaneous as nature, taking each day’s activities as our mood finds us. Steve comes from Zimbabwe, from generations of farmers. His love of the outdoors and the natural world around him started from childhood, and as soon as he could, he trained as a guide. Entering the tourism industry was a natural progression for him, he says. 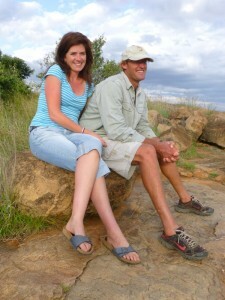 Over the years he has run canoe safaris on the Zambezi, and walking safaris in both Zimbabwe and Kenya. Annabelle is Scottish, but met Steve whilst working as a chef on Lake Kariba in Zambia. After seven years in Kenya, they decided they wanted to create what they feel is the perfect safari adventure. On the first day, we arrive in time for a late lunch and a tour of the camp. High on a plateau, Laikipia Wilderness is set under canvas, with five large tents that can accommodate up to 10 people, and a ‘mess’ tent with a dining area and a lounge, where guests can come to relax over a drink and pore over books about wildlife. The tented bedrooms are large and comfortable, with hand-crafted wooden beds covered with colourful local textiles, and the adjoining bathroom is partially open-air and bamboo screened. This is comfortable camping – not so luxurious that it takes away the ‘adventure’. Perfect. Annabelle then takes us on a game drive. We familiarise ourselves with the terrain and spot plenty of wildlife – from the diminutive dik-dik to the big mama elephant. 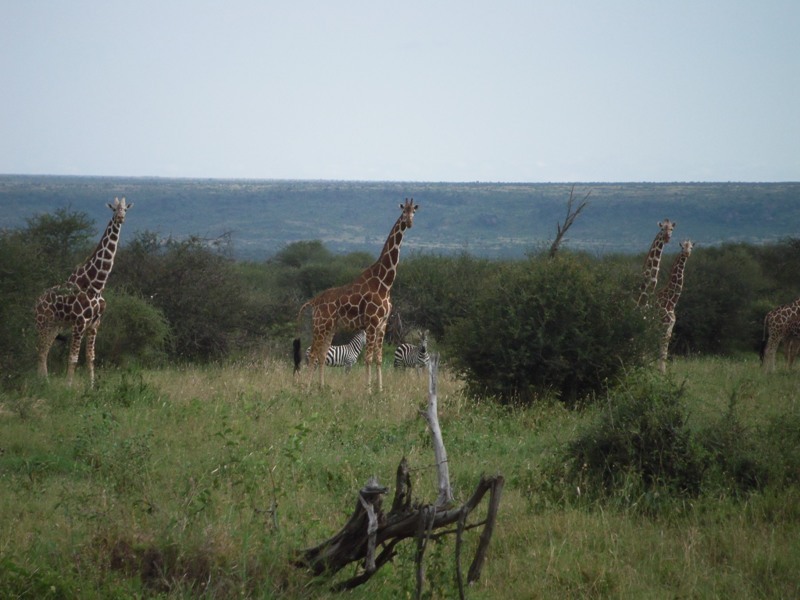 Laikipia is a sanctuary for over 80 mammals, including elephant, lion, leopard, Grevy’s zebra, aardwolf, wild dog and the reticulated giraffe. Its biodiversity is unique. It is home to half of the endangered black rhinos found in Kenya and provides a safe refuge for four of the world’s last seven surviving northern white rhinos. However, we have not come with the sole expectation of spotting the big five because that is not what this safari is about. We’ve all had that wonderful experience in the Mara. 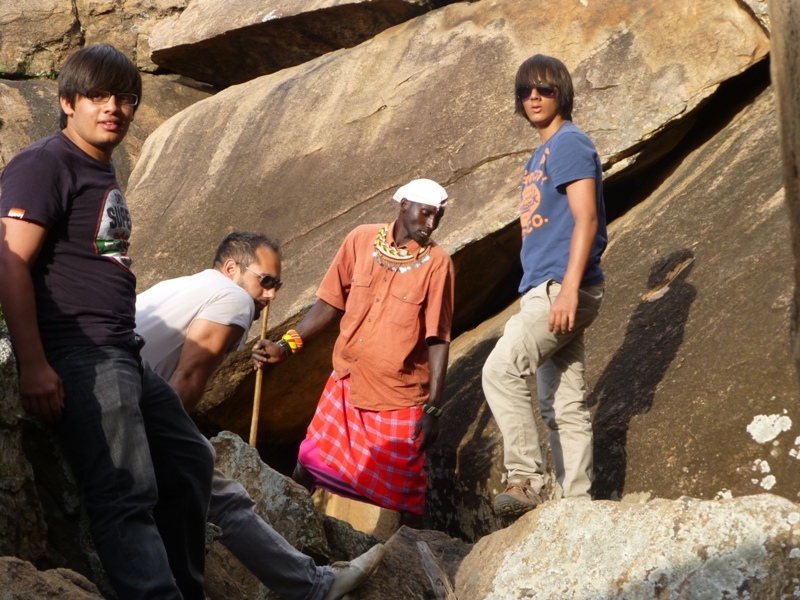 Laikipia is about adventure, feeling the earth under your feet, and getting as close to nature as possible. We get out of the car and Joseph leads our exhilarating climb up Baboon rock, an outcrop some 80 metres high. 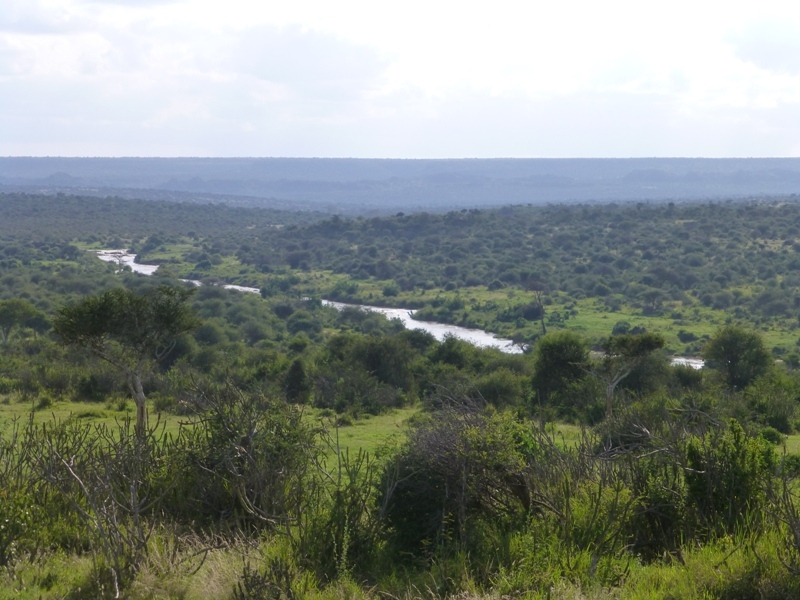 From the top, there is a breathtaking view of miles and miles of West Laikipia. At sundown we meet up with Steve and another guest at a lake, where a bush fire has been lit for our dinner. With the fading light, we sip our gin and tonics and tusker beers to the eerie sniggering of distant hyenas, the high-pitched twittering of passing wild dogs and the odd bray from a nearby zebra, as we sit on our chairs in the savannah. I’m feeling pretty exposed, but begin to relax as we exchange stories of the day’s highlights. Soon it is pitch black and two fillets of beef are placed on the crackling fire. Medium rare we all agree. Within a short time, we are serving ourselves from a white-clothed table – roast potatoes, vegetables, the most succulent beef, all accompanied by red wine. We all savour this special experience. On our drive back to the camp, we see nature slowing down its pace, but we keep our eyes peeled particularly for leopards for this is their hunting time. Sadly, we’re not in luck, though Steve says he’s seen them over several consecutive days. At 7am the next morning, we all gather at the mess tent and discuss the day’s activities over a cup of coffee and light breakfast. We’ve only got a couple of days so want to pack in as much action as possible. The early morning game drive is stunning. The air is fresh and cool, and the light golden as the sun rises. The animals wake slowly from their slumber to the alarm call of birdsong. Steve stops the Land Cruiser and we all listen to what sounds like an orchestral conversation between the slate-coloured boubou, the red-billed hornbill, the barred warbler and the while-bellied go-away bird. Steve’s educated ears identify them all. Unlike the safaris we’ve previously been on, there is no time limit to the drive. Steve, Joseph and the Land Cruiser are at our disposal for as long as we want and so we wend our unhurried way through thorn trees and bushes, up and down the valley to sight as much wildlife as we can. We get out of the car, wade our way through the arrostida, clingy, sticky grass, to look for scorpions, at the request of 14-year-old Louis. He is thrilled when we find a snake and baby scorpions. 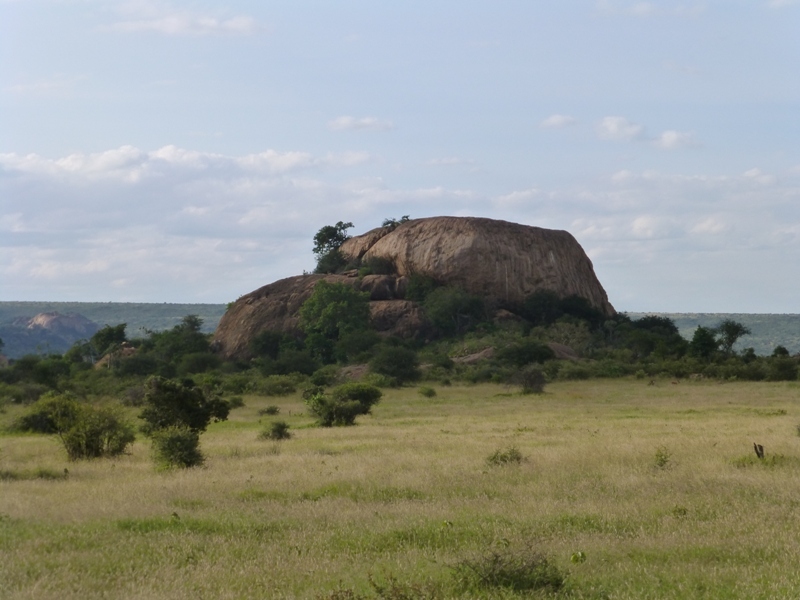 We clamber up another rocky outcrop, where elephants and baboons have been and sit at the top taking in the morning view. This feels as close to nature as you can get. On the drive back to camp, we encounter several family groups of elephants, leaving one of the most enduring memories of our safari. 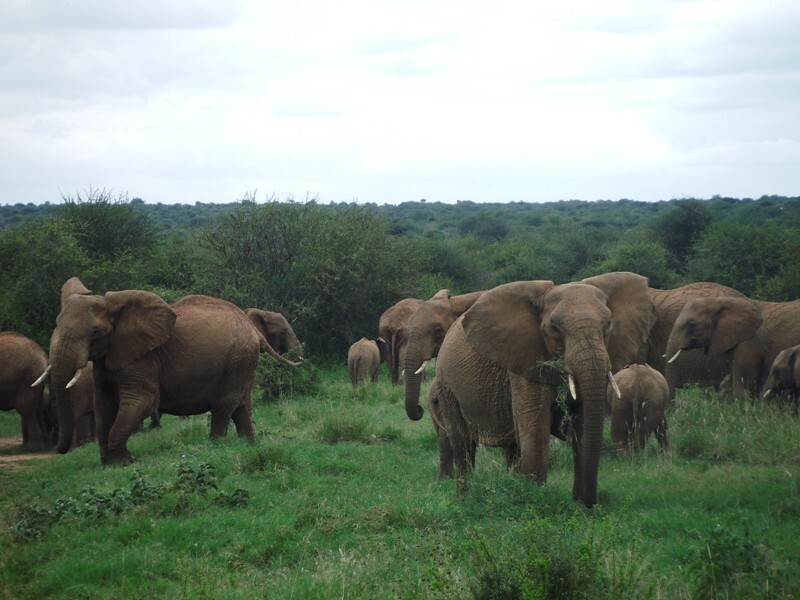 One hundred years ago, Laikipia had almost no elephants, but since the ivory trade ban in 1990, elephant numbers have increased making this the second largest elephant population in Kenya. Close-up, they are remarkable, beautiful and even terrifying creatures. The landscape is scarred by their presence – trees and bushes ripped and knocked down. Watch from a distance, and you see the interaction between baby and mother, the playfulness of the teenager, and are aware of the absence of the alpha male. Get too close and you will hear the angry warning trumpet from the most senior females, whose ears flare out and wave you away. We sit still, terrified yet irresistibly drawn to them. Our path home is blocked; all we can do is watch and wait patiently for them to clear the path. It gives us time to study these creatures in their environment and we’re all captivated. The next morning is sadly our last, but the excitement hasn’t dissipated. Steve takes the boys on an early morning drive, while I stay behind to soak in the stunning views from the camp. 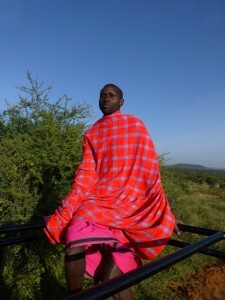 But Steve radios in sightings of wild dogs and those of us left at the camp jump in a car with Annabelle to join him. 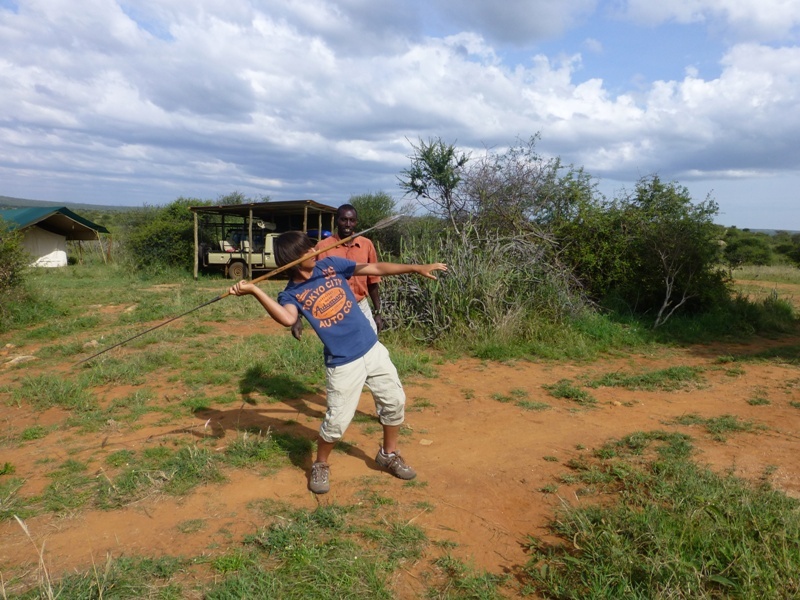 This is what’s so special about Laikipia Wilderness – the spontaneity and sense of adventure, made even more special by Steve and Annabelle, who really share their enthusiasm for this wild land with their guests. 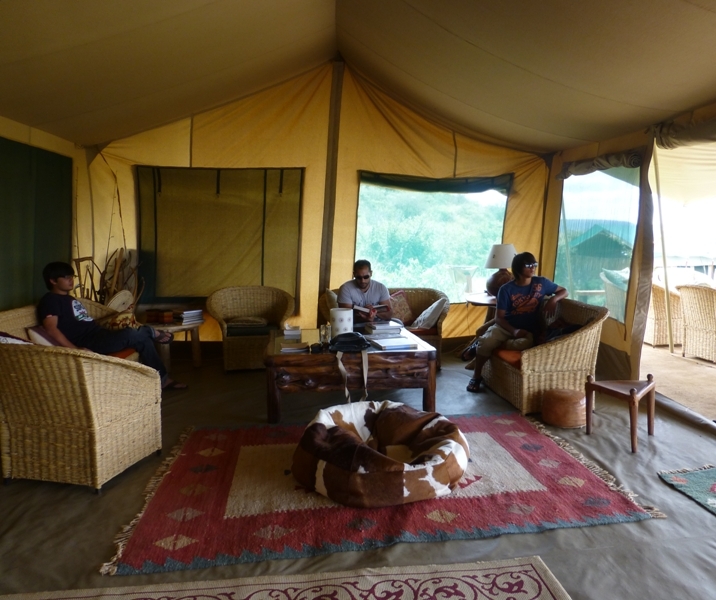 My trip to Laikipia Wilderness was courtesy of tailor-made safari specialist: Aardvark Safaris (Tel: 01980 849160. E-Mail: mail@aardvarksafaris.com ) who can arrange a stay at Laikipia Wilderness Camp as part of a Kenyan safari holiday in combination with other safari camps. It’s also possible to include time at the beach at one of the many beach properties dotted along Kenya’s Indian Ocean shoreline. Fly direct from London Heathrow to Nairobi. Operators include: Kenya Airways and British Airways. Onward flight by scheduled light aircraft through Air Kenya or SafariLink to Nanyuki or Loisaba airstrips where a vehicle and guide will meet you for the road transfer to camp which takes just over an hour. 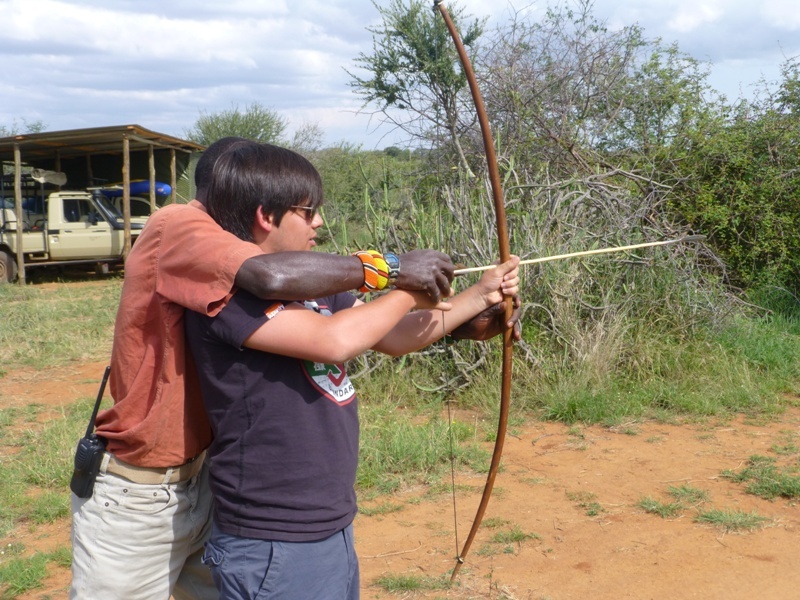 Walking, game drives, night drives, swimming, tubing and fishing in the river, Samburu village visits, birding, fly-camping. 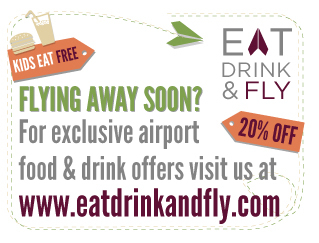 Including all activities, meals, drinks and laundry – from £265 per person per night. Teens aged 12 – 17 inclusive pay 75% of adult rates. Children aged 5 – 11 inclusive pay 50% of adult rates. Children 4 and under are free of charge (by special arrangement only). My wife and i got so thrilled John maengad to round up his basic research through the entire precious recommendations he was given through the web site. It’s not at all simplistic to just possibly be giving away guidance that most people might have been making money from. And we recognize we have got you to thank because of that. The main explanations you’ve made, the simple site menu, the relationships you help to engender it’s got mostly extraordinary, and it is facilitating our son in addition to us feel that that theme is satisfying, which is rather important. Thanks for the whole lot! Fabulous read. Really jealous of your trip now…Want to go!